I got my first Kleancolors from a swap box. I love the colors, but kinda hate the formula...and the smell. I know, I know...I'm weird about smells. At least this smell doesn't last beyond the drying process. I picked up the glitter on clearance at Target. (lots of Milani stuff has been on clearance at my local store. Check yours out!) I thought the two would be really nice and fresh, but I ended up feeling like an Easter Egg. 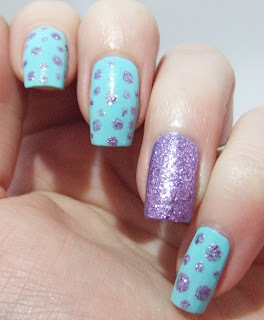 It is a super cute mani though! thanks! Honestly...I have no idea when Easter is.